When it came down to looking for a new mattress, It had been nearly eight years since I went shopping for a mattress. Apparently in that time, the industry was completely disrupted by the likes of Zinus, Casper, Tuft & Needle and so many others. As someone that’s internet-savvy, it wasn’t a complete surprise — I was aware of these companies, but have never tried any of their products. One thing i was shocked to see was the price of these mattresses you can buy online, specifically the price of the Zinus brand collections. What made it even more surprising was many of their mattresses were so universally loved and well-reviewed. During my search for a new queen-sized mattress, this wasn’t the first time I came across the Zinus brand. I was intrigued, but needed to look around more. Here’s a breakdown of how I came to my decision to buy the Zinus Ultima Comfort Memory Foam Mattress. After a week of looking over mattresses online and off, I knew I had to make a decision sooner than later as I had a new bed frame arriving within the week. Prior to purchase, I based my decision on the more than reasonable price and great reviews, I ultimately bought the Zinus Ultima Comfort Memory Foam mattress off of Amazon. Here’s the five factors I considered. First and foremost, the price just couldn’t be beat. Like I said above, a decade has nearly passed since I shopped for a mattress. The last time I bought a mattress, I decided on mid-tier priced mattress from Macy’s at approximately $850 that took nearly a week to be delivered (don’t forget that one usually tipped the delivery guys). Eight years later and I’m buying the Zinus mattress for $230 delivered in 2-3 days. That’s amazing. As detailed in this post here, Zinus’ Amazon’s return policy is 30 days, but I had no doubt that the company would honor their broader 100 day sleep trial and free returns within that time frame they promise on purchase. .
That’s because this space is not only extremely competitive, but mattress companies are built on word of mouth. Comfort isn’t the only important thing anymore, but how they work with their customers. After all, if Casper, Leesa, Nectar, Purple and others are selling their mattress-in-a-box for around the same price, offering the same sleep trials and return policies how else can they stand out? Customer service is one of those factors. Not only that, there’s over 1,000 questions that have been answered on the Amazon page. That tells me that their customer service is responsive and customer-centric. As a rule of thumb we ask our customers to allow 24-72 hours for the mattress to return to its original shape. Memory foam is very temperature sensitive and may take up to 1 week to fully expand in colder climates. With that being said you are more than welcome to try the mattress out after a good 2-3 hours. Luckily, we had a trip planned and wouldn’t get home for another five days. When we arrived home, the mattress was ready to be tested. When we first got onto the mattress, it honestly felt a too firm for my tastes. That night we slept for nearly nine hours and our initial concerns over the firmness dissipated. We came to realize that the firmness is a positive, it keeps the mattress from getting too warm and doesn’t sink in and have lasting impressions – other than the good impression. It’s now been 45 days since that first night on our Zinus Ultima Comfort and we’ve slept very well on every night. The odd thing is that the memory foam still feels too firm, but the next thing I know, I’m waking up after another good night of sleep. Price $200 for a mattress? That's nuts. In short, simply blown away! 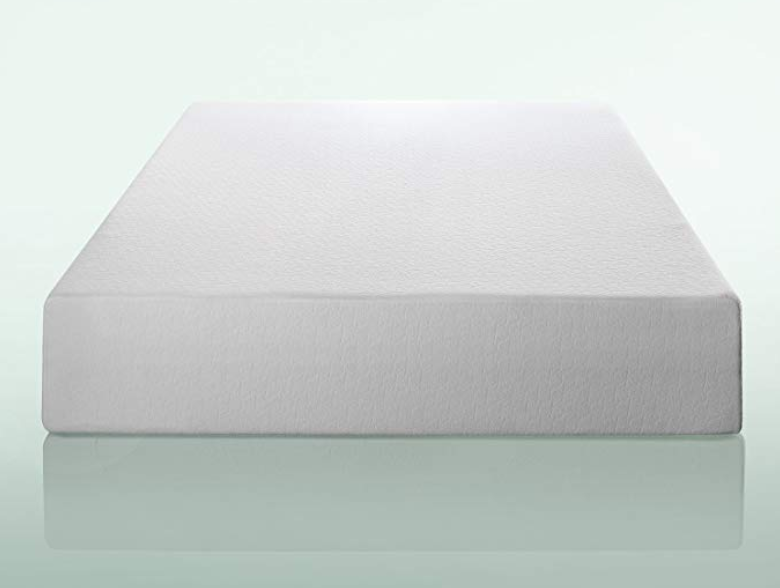 This is by far the best ‘thing’ I’ve ever slept on… I’m 6’5″, 180lbs and went with the queen 8″ mattress for me and the full 4″ mattress for my daughter. I slept on a luxury queen pillow top mattress and box spring for the last 6 years. We moved into a new place and I decided to use these mattresses temporarily while I took the time to test out my next long term set. On morning number one, for both my daughter and I, we couldn’t stop talking about how insanely comfortable the mattresses were. I got this Zinus Ultra Comfort memory foam. Figured reviews were good and won’t break the bank. Ok so I got it, popped it open and it sprang out. …I haven’t slept this good in years! Beats my old $1000 name brand home matress (SIC) hands down. This bed is terrible if you really have to get up and be somewhere in the morning. Seriously, I am a student and have trouble getting out of this bed even knowing that I need to be in class on time. It is luxurious and comfortable, keeps you warm but not too warm and just lets you float off to sleep. I hear the company has a good policy if the bed doesn’t live up to its standards, but mine has performed its duty just fine. review update January 2018 … this mattress is still retaining its firmness and is still incredibly comfortable. doesn’t have any divets or soft spots in the middle or edges etc that i notice. i saw some reviewers that were a little upset about little things like that but at the $300 price point for a king size its totally fine and i barely notice it. TLDR: we bought the firm one if i recall.. in case people are worried about choices that way… it was a little firm to start but it has broken in with use but does not have noticeable soft spots or low spots after 10 months of two people sleeping on it almost every night. ive been to Tempur Pedic stores before and the difference between this and a Tempur Pedic is not worth an additional $1000 imo. Our overall experience with the Zinus Ultima Comfort Memory Foam Mattress (Queen Size, 10 Inch) has been overwhelmingly positive. Outside of the slight inconveniences of the odor and waiting for the mattress to settle, we have nothing bad to say about the mattress. Based on all the glowing Amazon reviews and our experience, it’s not a surprise that Zinus is included in the list of one of the best mattresses to buy online. We’re being 100% honest when we say this is the most-comfortable mattress we’ve ever slept on. 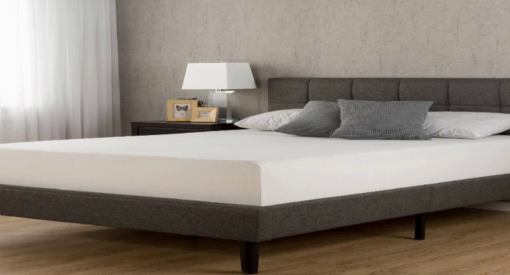 The memory foam isn’t as soft as one would expect but that hasn’t happened had any real impact on how our sleeping and enjoying of the 10-inch Zinus Ultima® Memory Foam Mattress.